Justin Hunt grew up in rural Kansas and lives in Charlotte, NC. In 2012, he retired from a long international business career to write poetry and memoir. 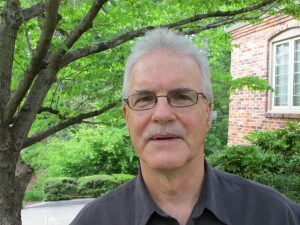 His work has won several awards and been published by a number of journals, anthologies and literary prize websites, including The Atlanta Review, Robinson Jeffers Tor House Foundation, WinningWriters.com, Spoon River Poetry Review, Comstock Review, Dogwood, Crossroads Poetry Journal, Freshwater Review, Pooled Ink and Kakalak, among others. Hunt recently finished a memoir about his relationship with his father, who was born in 1897 to Kansas pioneers. Check out Justin’s website here: https://www.justinhunt.online/. When I was a boy, my dad mentioned the State Bank robbery now and then, but only in his conversations with others. He never gave a full account in those exchanges, and I was able to assemble no more than a few, bare facts. I knew that he and his assistant, Dorothy Meils, had been locked in the vault. I’d heard him say the robbers had dressed like itinerant harvest hands with straw hats pulled low over their foreheads. Once, as he reminisced with his friend Fred Meeker about early-day cars, he said something about “that old Cadillac I chased the bank robbers in.” But he left it at that, a simple reference to an old car in a conversation about old cars. And yet, the little I knew about the holdup filled a back room in my childhood consciousness, a place that in my dreams resembled the State Bank’s vault. It wasn’t that I had nightmares about robbers bursting into the lobby, their heavy-caliber guns drawn and pointed at Daddy, Ash and me. I didn’t fret each time a stranger pulled up in front of the bank in a car with out-of-county plates. But I had an imagination. I drew unseen lines. They ran from the secret telephone at the back of the vault over to the loaded Remington .35 and, from there, back to that hot summer day when my dad was only thirty and Kansas was young and reckless. Before me lies a full-scale photocopy of the July 8, 1927 issue of The Wichita Eagle. Under a large, bold headline that reads “Lose Trail of Bank Bandits,” the story of the State Bank robbery takes up over half of the front page. In the center are four large photos: the old State Bank building, where I would later work summers for Daddy; Dorothy Meils, my dad’s part-time assistant; “Old Man” T.I. Ellis, the bushy-bearded Civil War veteran who’d been locked in the vault alongside Daddy and Dorothy; and Daddy himself, fixed in time by a reporter just seconds before he climbed into his car to race towards Argonia and Otis Howard’s fake gunfight. It is the picture of Daddy that yanks me into 1927. He stands next to the open passenger-side door of his 1915 V-8 Cadillac, the car that once belonged to my grandfather, J.N. Hunt. The car’s high top ranges above my dad’s trim, six-foot-one-inch frame, and perhaps he has just put the Remington .35 rifle in the front seat where he can get to it fast. He wears a loose-fitting suit, a tie and summer hat whose wide brim is turned down. The brim shadows his eyes and face, though not enough to conceal the mustachioed father I would come to know years later. Leading with his right foot, Daddy leans forward, ready to spring. He faces the camera, and resolve burns his image into the reporter’s film—the same resolve I sometimes faced during my early years, a look that says I have to do what I’m doing now, so make yourself useful, and stay out of my way. I’ve looked at this photograph scores of times since Daddy died. But it is only now that I study it. I let the whole of it settle into me: Daddy’s long arms and oversized hands, his driven look, the black and white lines and grainy wrinkles that bespeak another time. In my father, I see myself. And I realize that the questions I would ask him about the robbery are just a bridge to bigger questions, a way to tap the plumes that geyser up at the confluence of our two lives. “In the summer of 2013, I took a one-evening class with Maureen Ryan Griffin and spoke with her about signing up for the fall session of Under Construction. It seemed like the right vehicle for me, but I still wrestled with the belief that I should be inspired and disciplined enough to write on my own. I should just write what I wanted to write, I thought, then turn my work over to an editor. But as the summer wore on and I wasn’t writing much, I surrendered and signed up. It was a pivotal moment. Before I met Maureen, I’d written a couple of essays about my father and my relationship with him. I had a vague sense that I might have a full-length memoir on my hands, but teaming up with Maureen and her Under Construction group gave me the structure, feedback and support I needed to write the story of my dad and me to its end. I finished Dominoes Are Played at Joe’s Place in early 2016 and spent the next year reorganizing its chapters and revising the manuscript, page by page. Throughout the process, I used Maureen and the UC group to shed light on my blind spots, flesh out passages that deserved more coverage, trim up flabby language and take a scalpel to anything that was maudlin, overwrought or confusing.